So finally, macOS Mojave is installed on your Mac, hope so you are enjoying Mojave except when you encounter any bug. One bug can make your world upside down, that is Wi-Fi not working on macOS Mojave or Wi-Fi issues on macOS Mojave. When I updated my macOS to Mojave, in my mac when I put my mac on sleep mode and when I wake mac, macOS Mojave drops Wi-Fi connections. Although the speed of Wi-Fi connection decreased suddenly, Wi-Fi connectivity issues on macOS Mojave, etc. are the common issues that are reported by users. 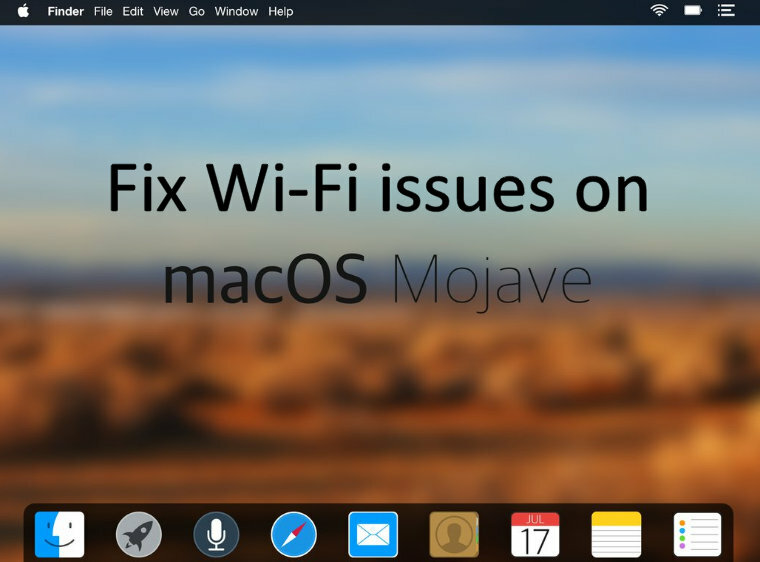 If you’re one of them and want to fix Wi-Fi macOS Mojave issues, then read this article and try to fix Wi-Fi issues on macOS Mojave. Before implementing any hard solution to fix Wi-Fi macOS Mojave issues, check if any update available for macOS and if you find update then update your macOS Mojave to the newest version. Please take backup if you are updating mac. Step 1: Launch the “App Store”. Step 2: In the “Update” section check for updates and download and install. Fix 2: Wi-Fi drops during sleep/wake? As I said before some of them reported mac is dropping Wi-Fi during sleep or wake and sometimes it takes more time to re-join Wi-Fi. Try these steps. Step 1: From the “Wi-Fi” menu turn off Wi-Fi. Step 2: After few minutes turn on the Wi-Fi and connect to your macOS Mojave. Before implementing this fix back up your mac, this steps involves system-level changes. So if things go south, then you will not lose your data. Step 1: From the upper right corner, drop down “Wi-Fi” menu and turn off. Step 2: Now, create a new folder on the main screen, or even you can use existing folder and name it “Wi-FiConfigBackup”. Step 3: From the “Finder”, expand “Go” menu and then select “Go To Folder”. Step 4: “/Library/Prefernces/SystemConfiguration/”, enter this code into window and tap “Go”. Step 5: Search and select all these files. Step 6: Open the “Wi-FiConfigBackup”, and drag the above selected into the folder. Step 7: Now, reboot the mac. Step 8: After mac restarts connect the Wi-Fi as usual. Step 1: Open “System Preferences”, from the Apple Menu. Step 2: Open “Network” and then select “Wi-Fi”. Step 3: Now, on the top, you will find “Location” panel, drop down and select “Edit Locations”. Step 4: Next, Tap on “(+)” sign and give some identifiable name which suits you. Then tap “Done”. Step 5: Pull down the “Network Name” panel and select the Wi-Fi network to join. Step 6: Tap “Advanced” button. Step 7: Now click on “TCP/IP” and then click on “Renew DHCP Lease”. Step 8: Now tap on “DNS” panel and then click on “(+)” symbol and enter “8.8.8.8” and “8.8.4.4”. Step 9: Then, open “Hardware” panel and set “Configure” to “Manually”. Step 10: And “MTU” to “Custom” and enter “1453” below in section. Step 11: Tap “OK” to end this. Step 12: To save all the changes you have made to tap “Apply”. Step 13: Close this window. Step 14: Now, launch “Safari” and check if it is working or not. If still Wi-Fi issues on Mojave isn’t fixed? Fix 5: Connect your mac with different Wi-Fi connection, and mac works perfectly then there might be an issue with your router. Fix 6: Try to connect another device to your Wi-Fi. Fix 7: Switch Wi-Fi channel from 5GHz to 2.4GHz or vice versa. Fix 8: If none of the above fix Wi-Fi issues on Mohave then downgrade the macOS. Do you find the solution to fix Wi-Fi macOS Mojave problems to your MacBook Pro, MacBook Air, MacBook Touch Bar Etc? Then drop your reply in the comments! Wow, I changed the DNS to the Google ones – was set to the IP of my router [which had the Google DNS] – and also adapted the MTU. Blazing fast, sites load in an instant now.